The Five Point Five Story is in a Book! The last couple of months have been a whirlwind and today, after several months I am getting back on the blog train! So much has happened that I don’t really know where to start except to say the book is out! 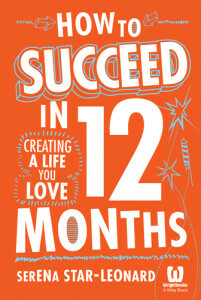 “How to Succeed in 12 Months: Creating a Life You Love” is a practical and motivational guide to making your big dreams a reality. It follows the story of Five Point Five and our journey to sell our stuff and travel the world, filming documentaries – with no end date! I also share stories of amazing inspiring every day people who have decided to ignore the status quo and create thrilling and fulfilling lives that they once thought impossible. The beauty of this is that armed with the tools in this book, you can do this too! Whether you want to sail the world with your family, start a business, find your dream career, make a difference or change the world in some way, you may find it is more possible than you think! The book is in stores in Australia and New Zealand, available through online retailers globally, or you can buy one from us directly. A massive thanks to everyone in this community, as our readers and volunteers you all contributed to this book whether you know it or not! Do You Want 1000 Days of Travel? California Wine Country: Where Should You Go?